To create the illusion of the 3rd dimension we need to understand how we see depth so that we can recreate it convincingly. 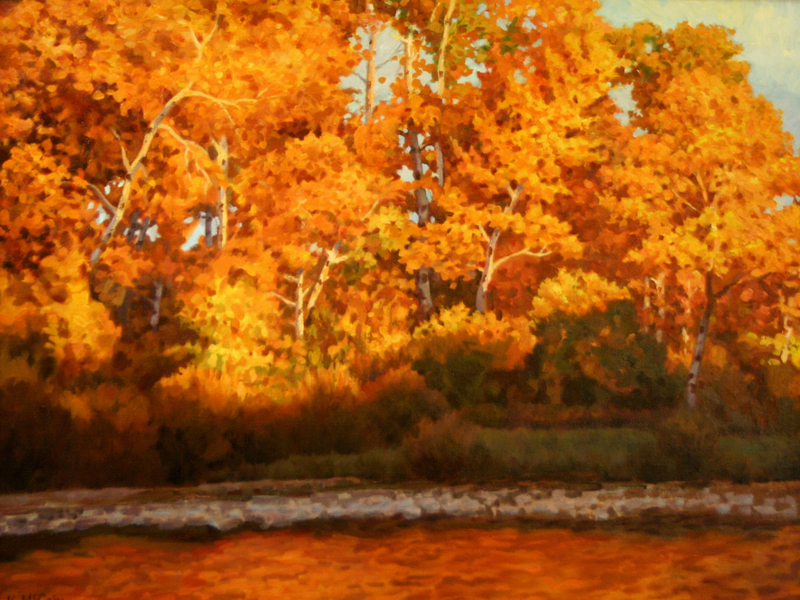 For more than 500 years artists have used a simple process for creating the illusion of depth. That is perspective drawing. 3d games and programs employ this method, but until the 1990s most of this was done by hand by artists, illustrators, architects and mechanical draftsman. It is the most important Key to understanding how to draw convincingly. Through understanding and training in perspective as an artist, your imagination is expanded and you have the knowledge to draw, distort and create anything you want, but I am getting ahead of myself so I will start with the most basic ideas of perspective. Perspective starts with an understanding of a few basic concepts. Let’s have a look at them. Right Angles or Perpendicular Angles – Perspective is all about breaking things down into squares and boxes or cubes. That means we need nice straight corners. Those straight corners are 90 degrees we refer to these types of angles as “Right Angles” or “Perpendicular Angles”, so since we are using boxes or cubes we are always using 90-degree angles. One Point Perspective– This is where all the parallel lines converge at One Point on the Horizon Line/EyeLine. With one point we are seeing most of the front of the cube or box sometimes called the “front face” of the cube. 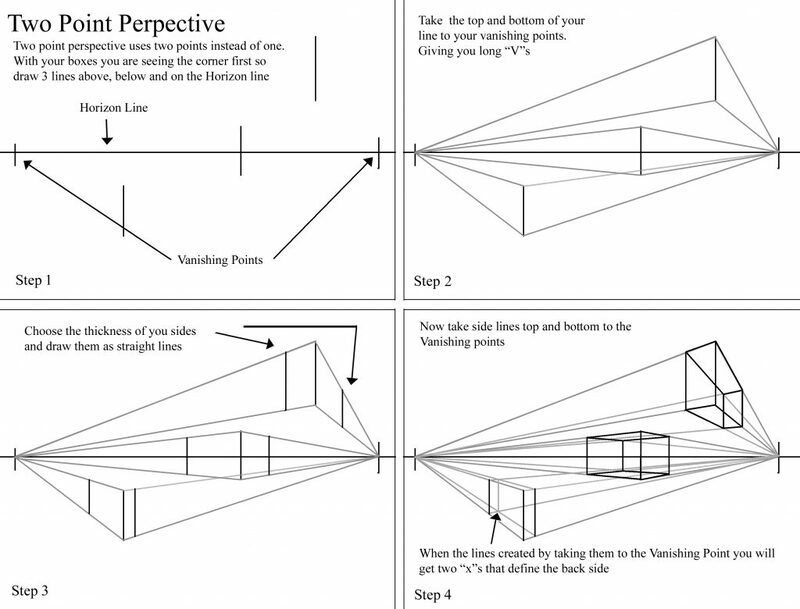 Below are the steps for creating boxes using One Point Perspective. Two Point Perspective – As the name implies this approach use 2 vanishing points on the Horizon/Eyeline. The reason for this perspective is we are now looking at our box or cube from it’s “corner” and not the ‘front face.” Instead of starting with a rectangle or square. We start with a “straight Line” the “straight line” is the corner’s edge that is facing us. Below is how you develop boxes in perspective. This gets you familiar with the ideas on one an two-point perspective. If you would like to know more about the steps of creating cubes and boxes visit youtube they have some great in-depth videos on the basic steps of one and two-point perspective. Unfortunately, there aren’t a lot of great explanations on youtube on how to use the perspective effectively in your drawing. In my drawing and painting classes, we go in-depth into how to use perspective and unlock its power. 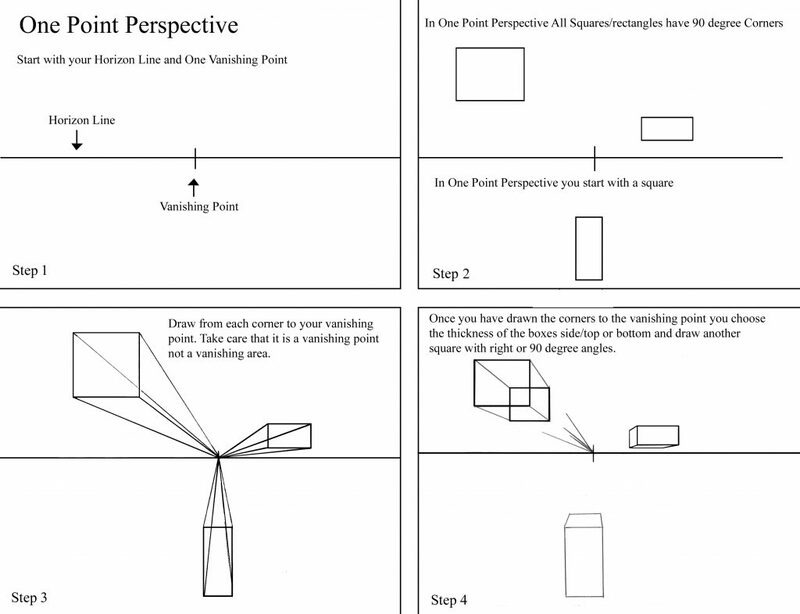 If you would like to learn more about how and why to use perspective sign up for a class today. When I was young I had strange misconceptions and ideas of how to draw. I would pick up books and see artist describing things into basic shapes and I would think to myself that’s not how you draw. You just draw. Little did I know how much I was wrong! After years of training and a twenty year professional career in illustration and fine art I know it is “the key” to drawing and painting regardless of style. 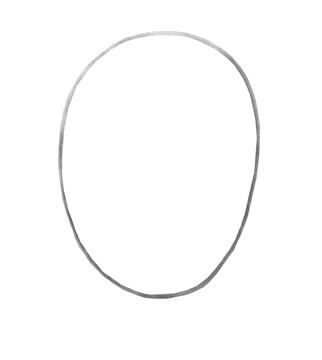 Whenever I am having troubles drawing I always use basic shapes to make my drawing better and more accurate. 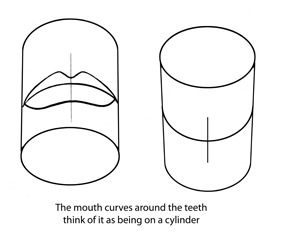 Whether I am drawing a portrait, wildlife or still life everything can be broken down into basic shapes. 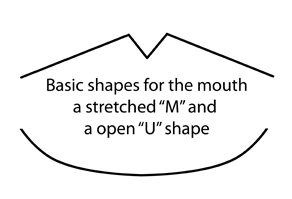 Here is a basic representation of the concept but I use this in much more complex drawings. Anyone who has picked up a pencil and wanted to make an accurate drawing knows the most important thing is proportions. That mean you need to divide things up. Sometimes into several pieces. Now you can eye ball it but if you want to get to a better level of accuracy then you want to use a few simple techniques that will take your drawing to the next level. Now I can use this method to divide it into any number of parts but for this exercise it will divide it into five. 1.First draw the line you need to divide using a straight edge. 2. Draw a line of “any angle”(it doesn’t matter the angle) from point “A”. As pictured below. 3. Using a compass or a divider or even a ruler or even two random marks of any length. Mark off five equal spaces along your line. 4. Connect you last marked space to point “B.”(This is very important) Then using parallel lines connect the marked points to the line “AB”. 5. Now you have a line that is divided equally into 5 parts. Now the great part is you can do this by hand the same process and you will divide things much more accurately and quickly than you ever thought possible. Give it a try. Also this is done with straight edges and such but do this by hand will give you much more accurate divisions even though you lines won’t be as straight. You will be far more accurate than if you “Eye Ball it”. Where this really becomes important is this can be used in perspective as well. That’s where the true power of this shines. It a variation but the process is essentially the same. 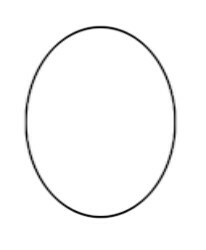 Portrait from the Egg shape. 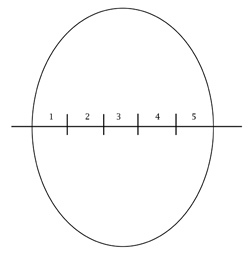 Step 1 – We start with an oval or egg shape. 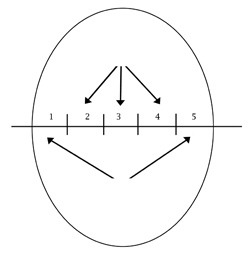 Step 2 – Once we have drawn our oval we will cut the oval in half with a horizontal line. This is the “eye line”. From the “eye line” to the bottom of the oval we will divide this space in half to mark where the “nose line” is located. From the “nose line” to the bottom of the oval we will divide this space in half once again to establish the “mouth line”. One very import note the mouth line is where the bottom lip will touch or close to it. View the illustration below to make this more clear. The width of the head is measured in “eye spaces”. 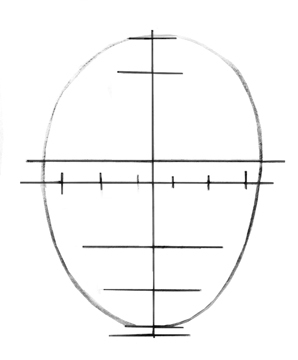 The head width is generally 5 eye spaces wide along the “eye line” which should be the widest part of our oval. Let’s divide that into five eye spaces as seen below. Now using a center line will make things easier. For those who follow my newsletter I had an art tip on dividing a line of any length into five equal sections which you can use, but for the most part when I was a student we where taught to just eye ball it. Then using a ruler and or your thumb and pointed end of the pencil to measure and check each section to make sure the spaces were equal. If you remember one things please remember this. Eye spaces 2, 3, and 4 are always the same width. This is the two eyes and the space between your eyes sometimes referred to as the “third eye”. Eye spaces 1, 5 can vary depending on the person’s face how round or how thin they are and so forth. 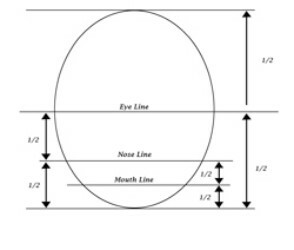 Step 5 – The Eye Line Measurements are Key. 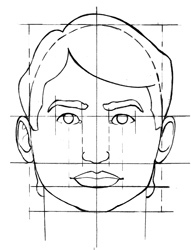 The five spaces help us locate all other measurement of the face. 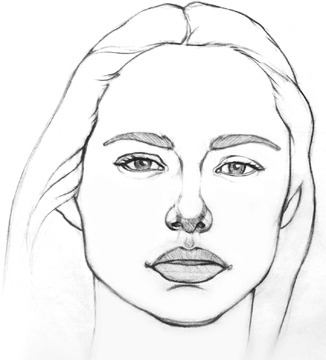 Nose– drop straight lines from the side of eye space “3” to give you the width of the nose. 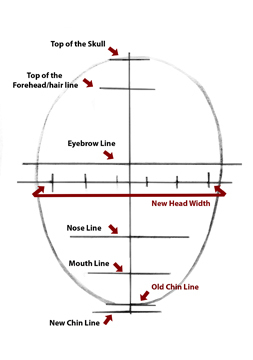 Hair – Your hair grows off and from you skull so the illustration show the original oval or egg shape as a checked line and the hair line out and off the skull. Neck – Use a cylinder for the neck. Now the neck can be dropped straight down from the ears if the person is a line backer or something. If it’s in too far from the jar it looks like a cartoon neck so somewhere between those extremes are where the neck will be. Step 6 – Putting it all together. 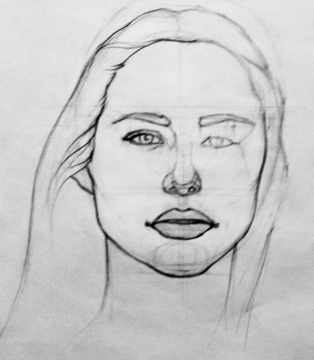 This shows a very simple generic and simplified portrait using the proportions I talked about. Look where the simple nose falls or where the lips, ears and so forth are located. 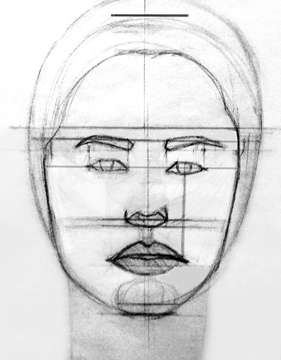 Next month will go through the steps of creating a portrait using these proportions we have discussed today. Eyes are one of the most important things when drawing people. Many people struggle when drawing eyes. These easy steps will help you draw eyes more accurately. Lets start with the basic angle in the top lid. Step 1 – The Top lid is comprised of 3 main angles. The innermost angle from the tear duct is usually the most extreme angle. Each person’s eye and therefore the angles are different. Practice looking for the 3 angles while drawing several different eyes. Step 2 – The Tear duct is a trapezoid or modified triangle shape. 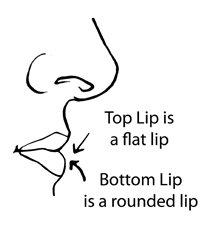 Everyone’s tear duct shapes are different. So analyze the shape of the person’s tear duct. It’s an important feature of the eye. Step 3– The top lid is comprised of two main angles. The first angle at the lid wraps around the eye ball is the most the second is softer at it connects to the tear duct. Step 4 – Round your angles and make them soft arcs. Then there are just a few more things to remember. The lids have a thickness. This gives volume and depth to you eye. The how much of the thickness of the eye you see can indicate the angle you are viewing the eye at, this eye below is being seen from straight on. If I was looking down on someone I wouldn’t see the thickness of the top lid. If I was looking up at a person I would see more of the top lid thickness and less of or even none of the bottom lid. Step 5– The eye’s top and bottom lid have a thickness that shows the skin wrapping the eye ball. Again this gives shape and form to the eye. Look of the fold. The top lid fold is always darker than the lower one. If you are not careful the person will look like they haven’t slept in weeks. Step 6 – Putting it all together. Next try putting in the values and you will have a very convincing eye. I will cover a more advanced explanation of drawing the eye in coming articles. 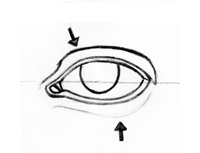 The steps above are the most basic ideas to consider when drawing the eye. 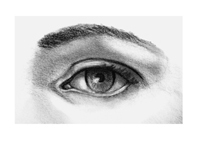 I will add posts on shading an eye, basic eye anatomy and drawing a more advanced eye. 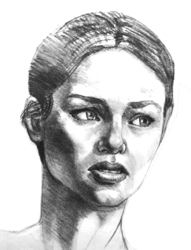 Continuing with the theme of drawing the portrait I will cover drawing the features. Now in January I covered drawing eyes. So I thought it would be fun to continue with one of the most neglected features, ears. 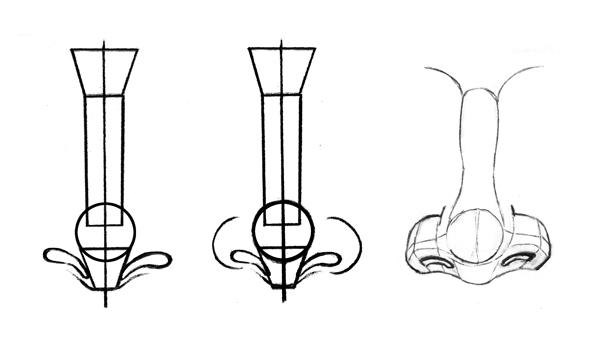 The basic ear shape is comprised of two main shapes. 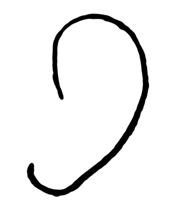 A “?” shape for the outside of the ear and a “C” shape or rhythm for the inside. 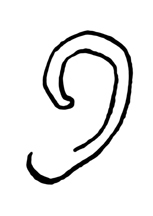 Now if you look at an ear you will see that it is a little more rounded than a simple “C”. 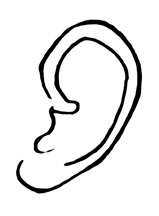 To get the main shape start by establishing the main angle changes of the outside of the ear. Change you straight “plane change” lines into soft arcs and you will end up with something similar to this. 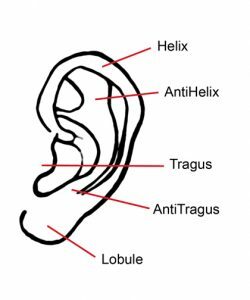 The cartilage that follows the outside of the ear called the helix actually starts from inside the ear behind the ear flap called the tragus, look closely in the mirror to observe this. The helix follows the ear but transitions into the ear lobe. Now we add the tragus which transitions into the “?” shaped part of the ear called the antihelix. Once we add these features we have a very accurate contour drawing of the basic ideas of the human ear. 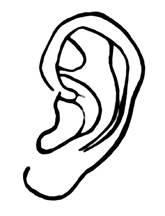 Study the ear and draw to become more familiar with this fascinating feature.